Start Menu Click History Viewer allows you to view all the information stored on your computer that is saved when you open anything from the Start Menu! Reads and displays the information saved by Windows® of all programs open using the start menu. Allows to sort by date and filter by text. 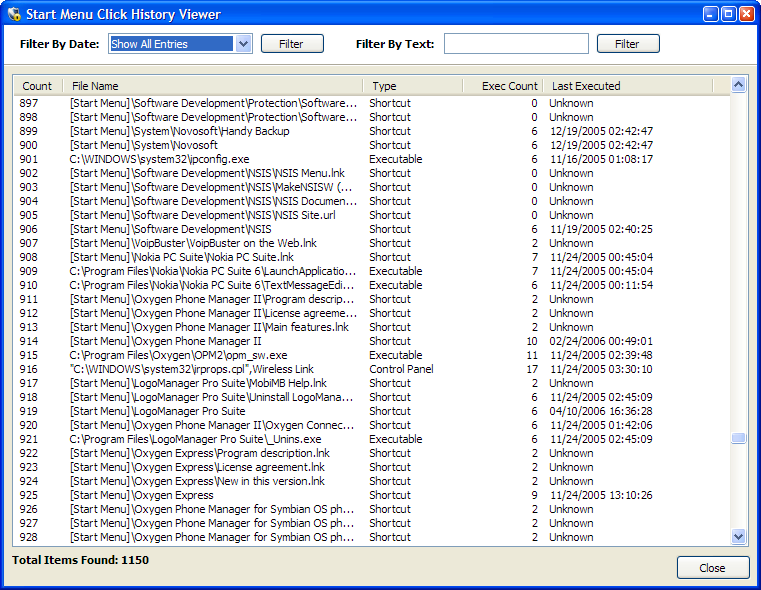 Start Menu Click History Viewer is absolutely free of charge for home and corporate users alike. What is Start Menu Click History Viewer? Every time you open a program from the start menu, the date and number of times you used it is stored in an encrypted database. The Start Menu Click History Viewer reads the Explorer UserAssist Data from the registry and allows you to see exactly that information is stored in this location. When first looking at the contents of this registry key one might think they have been infected by a trojan or something. But in fact, it's EXPLORER.EXE, a Windows system program, that writes these keys. Among the information stored you will find references to local files, titles of web pages, .url files in favorites, and shortcuts. There are entries for things accessed only when Windows was first installed (like drivers). This means that Windows logs this information and never deletes the log data. In addition of being a very high security risk this also bloats the registry, which fragments it, slowing Windows down.